Don’t leave home without your Personalized Breast Cancer Awareness Travel Mug. With this Breast Cancer Personalized Mug, you will show your support wherever you go. 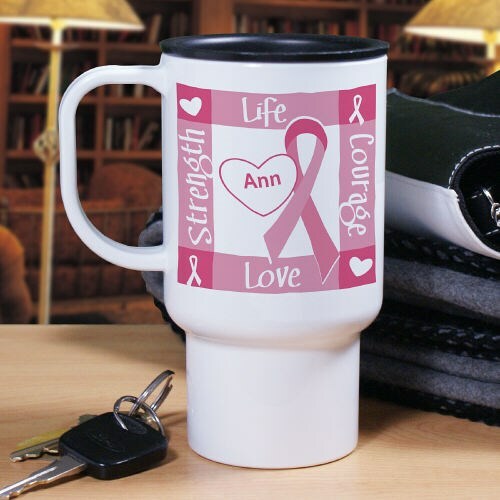 Life, Courage, Love and Strength proudly describes every portion of your mind, body and soul fighting for a cure when you use this unique Breast Cancer Support Travel Mug. One of our many Breast Cancer Gifts, our Personalized Breast Cancer Travel Mug is dishwasher and microwave safe and holds 15oz. This sleek polymer travel mug includes a resilient plastic lid, lightweight and unbreakable. Includes FREE Personalization! Personalize your Breast Cancer Travel Mug with any name. Our Personalized Breast Cancer Awareness Travel Mug is perfect for that person who is always on the go. Take your Awareness Travel Mug with you on your daily trips to show the world you support those suffering with this disease. This Personalized Breast Cancer Travel Mug design is also available in a Personalized Coffee Mug.